Mud and Brick Ovens — hey, it involves wood! I remember the first time I had a wood fired pizza. I was in Italy after college, and I decided to get some lunch. Pizza looked like a good idea, especially since it was cheap. A 1/2 liter of wine and a pizza was running about 8000 Lira, which at the time was around 5 to 6 dollars. I went to the counter, ordered my pizza, and the guy behind the counter grabbed some dough, shaped it, put some sauce and cheese on it with some basil, and threw it into a brick oven behind him with a live wood fire. I walked to the end of the line, got my carafe of wine and a glass, and in under 3 minutes, the pizza was piping hot and on a plate for me. Sitting outside enjoying my lunch, the pizza was a revelation. It was thin, but chewy. The crust had this incredible crispness to the outside, and the cheese was nicely browned. It was unlike any pizza I had ever had in the US. So, several years later, I start to find pizza similar to what I had all over Italy turning up in the US. They were always cooked in large brick ovens with wood or coal fires. A good pizza takes about 3 minutes to cook in these ovens, because the heat is so intense. 700-750 F is the typical temperature range pizza bakers look for. This is far beyond what kitchen ovens can do, most of which top out at 500 F. You just can’t get the same crisp, chewy crust without the intense heat. 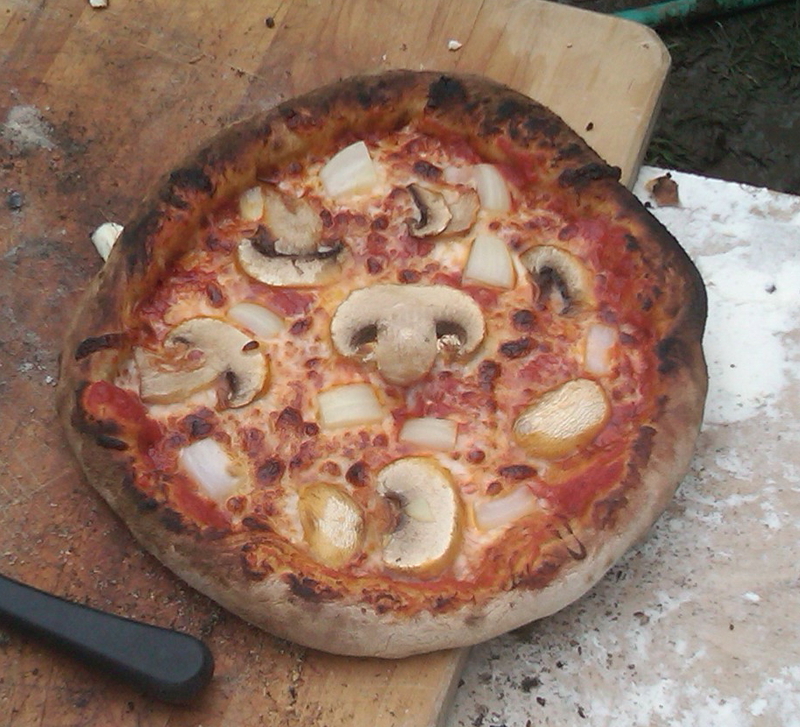 I decided about 3 years ago, I wanted to make a pizza oven in the back yard. Of course, I checked out the internet, and there were lots of various designs. However, these all looked big, expensive, and very time consuming to make. They weigh hundreds if not thousands of pounds, and require a good footing, something daunting with the risk of frostheave here in Maine. So, I decided to hold off. I later saw a book, Earth Ovens by Kiko Denzer in the bookstore and bought it. Unlike brick ovens, these were made from clay and sand, and molded onto a form. Cheap, and much easy to build, these looked interesting, but very transient. At its heart, it is mud, and rain and snow will wash it away, but for a summer project, this looked like it maybe a good idea. Then my wife saw a course in the Adult education course guide where I live that had a class on earth oven making. I was late, and did not get into the class, as slots were very limited, but about a week before the class, someone else dropped out, and I got to sub in. Stuart Silverstein is the gentleman who was running the class, and he has quite an extensive experience in the process. His blog is here, and he has a new book coming out this summer that walks you right through it. 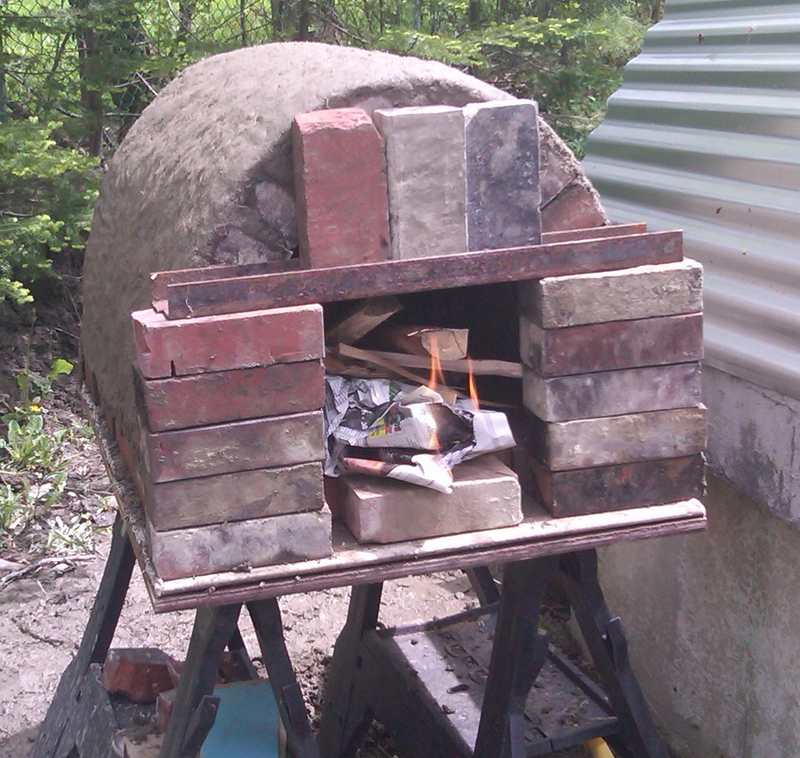 He built his own 32 inch mud oven in his backyard several years ago, and it is still going strong. The corrugated metal shielding is to keep the rain and snow from damaging it. So, today, I went over at 9am, joining about a dozen other people, and by 11am, we had built 2 ovens. I worked on the brick oven using basic old red bricks, and mud from the backyard and sand from Home Depot to act as mortar. 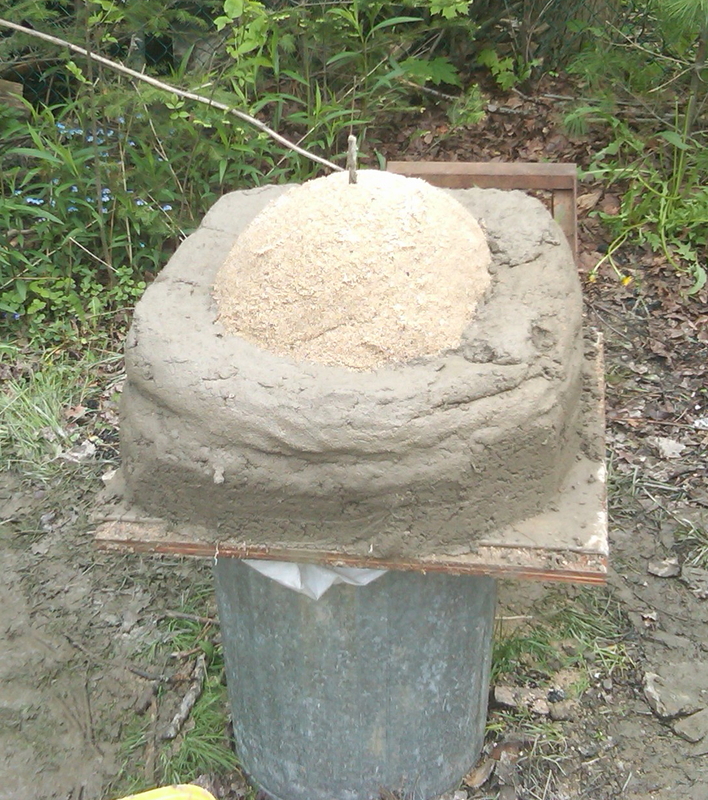 2 other teams built 2 mud ovens using sand as a form. 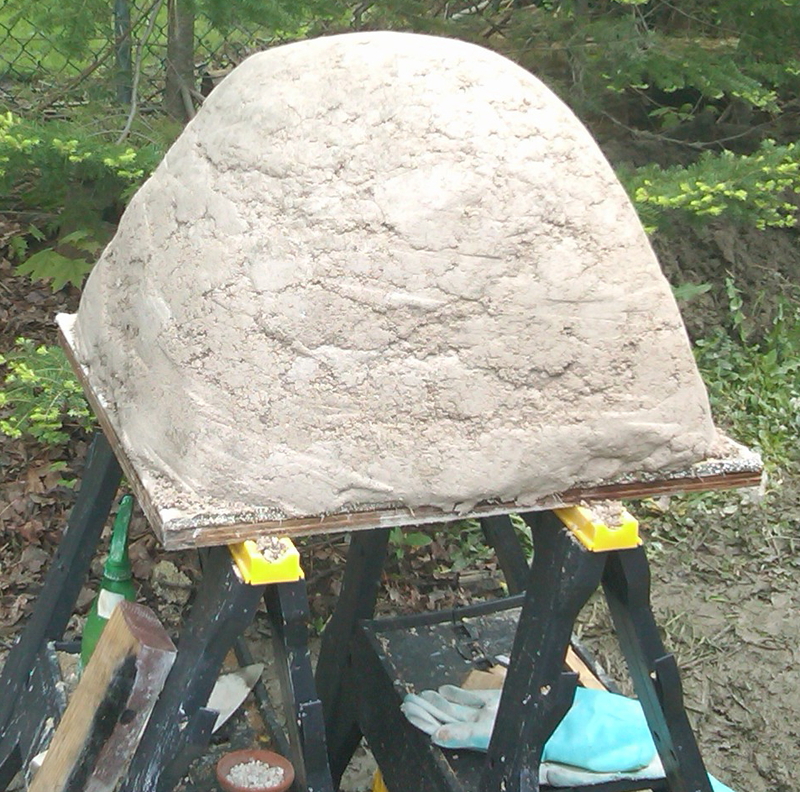 First sand was wet down, and then stacked into a large dome on top of a brick floor, about 16 inches in diameter. Then about 4 inches of potters clay and sand were mixed, wet to the proper playdough like consistancy, and placed around the sand form. Sand form in the center with mud walls going up around it. As the mud dried, it started to harden, forming an igloo shape. And yes, it is sitting on a trash can. The base is concrete board supported by 3/4 inch plywood. These ovens were temporary structures built just to show the techniques, and are not intended for long term use. 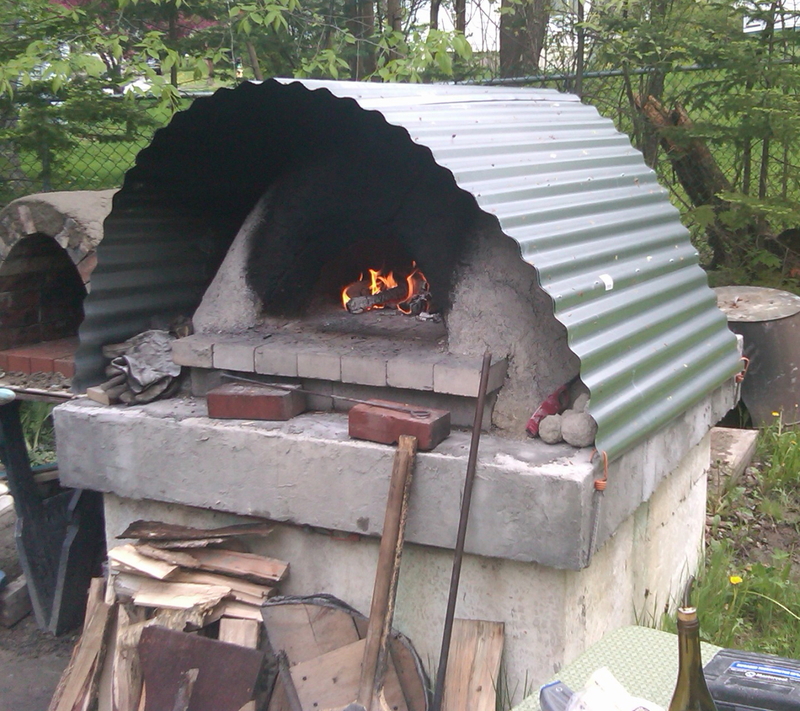 I worked on a brick oven, where we used an plywood arch form to make the arches. It was incredibly strong, and when the mud was used to mortar it together, was very secure. 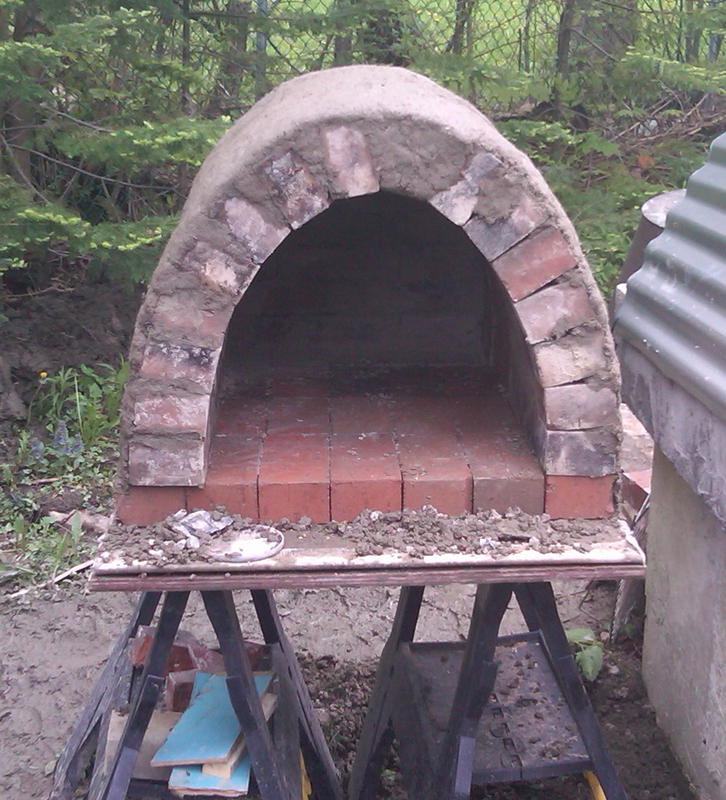 It was also the fastest and easiest of the ovens to build. We just stacked some bricks over the front, and used some angle iron to hold bricks over the top of the arch. This keeps the heat from just rushing out the top of the archway, forcing it back into the oven. 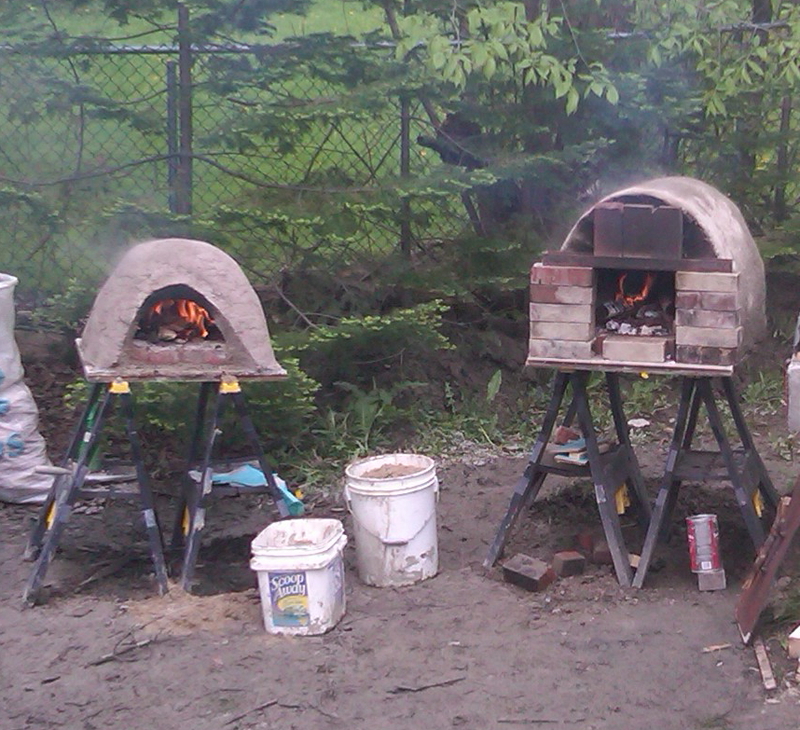 We got 2 of the ovens up and fired, the third one was too wet to cut the doorway and pull out the sand, but overall, I was impressed how far we got in about 3 hours. Ovens being fired within hours of starting construction. We then used some dough Stu had made, and others including myself had brought, and proceeded to cook pizza’s and flatbreads for the next few hours as we pepper Stu with questions. The floor of the brick oven was over 800F at one point, and the whole oven dried and cured in about 3 hours from firing. Stu was going to let it cook, then break the whole thing down and reuse the bricks in his next class. I had a great time. I learned a few valuable things. The first is that shape is not as critical. Dome vs vault does not really matter much for pizza, it is still dang hot, and will work fine. Also, smaller is better. The 32 inch floor of Stu’s oven would let us cook 2 pizzas at once, and by the time we were ready to put in a 3rd, they were done. My gut reaction when I was researching this was to make a big oven, 48-52 inches. However, the pizza cooks so fast, you can’t keep up, so the oven does not have to be big. If you want to bake bread, a bigger oven fits more loaves, but I don’t see myself baking more then a few loaves at a time, and a pizza oven will hold plenty of heat to get the job done once you sweep out the coals. Also, smaller ovens take far less wood and less time to get up to temp. For big commercial operations, it makes a difference, for backyard pizza parties and 1-2 loaves of bread, not so much. So, with this knowledge, I think a nice 32 inch oven would like good off my patio. I think I have another summer project.